I was tickled when Callye of The Sweet Adventures of Sugarbelle invited me to her Pumpkin Project Party! Outline the pumpkin cookies with a decorating bag filled with orange royal icing and a #3 tip. Let icing set for about 15 minutes. Add water (a few drops at a time) to the orange royal icing until it is the proper consistency to fill the pumpkin cookies. Do the same with the brown royal icing for the stems and the black royal icing for the shoes. Leave the cookies to dry overnight. Make the marshmallow noses (link to directions is above). Make the mustaches with the black candy melts and candy molds according to package directions. While the cookies lay flat, use some royal icing (in a decorating bag) to adhere the eyes, noses and mustaches to the cookies. Leave the cookies to dry until all the components are firmly attached to the cookies. Lastly, Use some black royal icing to adhere the pumpkins to the shoes. Use cans to hold each cookie upright while they dry firmly attached. These are so cute, I knew they were yours from a distance. I LOVE this guy!! He definitely made me smile! I love his nose!!!! And his shoes!! Love HIM!! LOVE the new blog design! And these are hilarious. Had to single them out on edible crafts :). LOVE the BLOG LOOK!!! 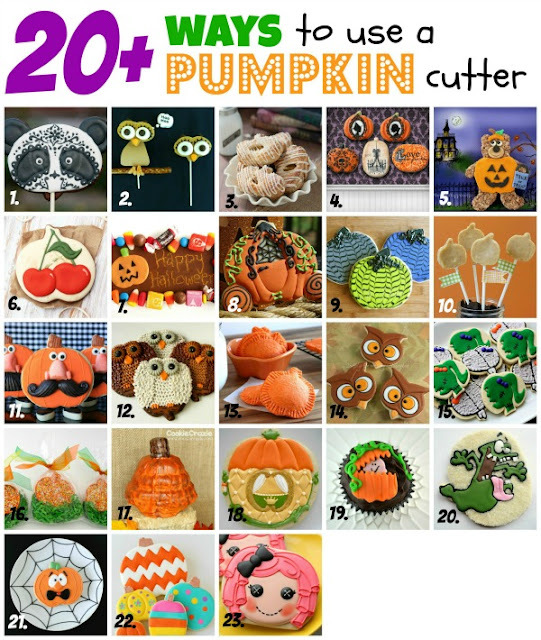 What a super cute, neat idea to do with a pumpkin cutter and it goes w/o saying how awesome it is to be included with you on this amazing collection. It definitely make me smile! What a cute way to celebrate pumpkins. So cute! The new blog design rocks! I love what you created with the pumpkin cutter. Your pumpkin's face is silly and so adorable. Oh my goodness - these are beyond cute. My daughter loves Mr. potato Head and I can't wait to show her these cuties! These are a hoot! Reminds me of those faces you can put on trees but these being edible is the best! I LOVE YOUR NEW LOOK!! Oh my goodness, it's gorgeous!!!!! Oh, and these pumpkins are super cute too! Super stinkin' cute! You did a really great job and with so many components! So, so, so creative... I love them! Best pumpkin faces ever!!! Hands down!!! So honored to be working with you!! I haven't seen your new blog design -- I LOVE IT!!! So fun!! And these faces are fantastic!! (And not at ALL the weirdy faces I was thinking about!! Mine really were weird and not cute and amazing like yours!) Do you remember where you got your mustache candy molds? My kids would love them! These are so ridiculously cute! Mr. Potato Head Pumpkin Face. AWESOME. I love these, it's such a fun idea. I thought of Mr Potato Head when I saw them too. Brilliant. These cookies are so cute Sue! Oh my goodness these make me smile! This is amazing! So funny and festive. Great job. I hope you will link this up to my Wickedly Creative Halloween Ideas Party if you haven't already. These are just so fun and creative! You always have such amazing ideas Sue!! Cutest cookies ever!!! My weekly linky party--One Creative Weekend--has gone spooky this week in honor of my thirteenth party. If you haven’t already, I hope you’ll visit "One Creative Weekend" on OneCreativeMommy.com (open every Fri-Wed) and link up this idea and anything else you’d like to share. (You can include non-Halloween posts as well, but feel free to link up as many Halloween-themed posts as you like.) There are two categories—one for Halloween and one for everything else. OMG! THESE R SO CUTE! WOw!! Love these! Too cute and so wonderful. The mustache just puts it over the top. Mustaches on pumpkins? It just doesn't get any better than that. Found you through Itsy Bitsy Paper's link party. Pinning this lovliness. Thanks for sharing.